Waddington Custot is pleased to present Invisible Cities, curated by Flavia Frigeri. Taking its title from Italo Calvino’s novel, Le città invisibili, this exhibition brings together an international group of artists who, in different ways, explore concepts of the ideal city and discover the necessary coexistence of the real and the imagined. The exhibition includes drawing, painting and sculpture by Giorgio de Chirico, Fausto Melotti, Maria Helena Vieira da Silva, Gego, Arakawa, Giulio Paolini and Tomás Saraceno. Calvino’s Le città invisibili, published in 1972, imagines a fictional conversation between the Venetian explorer, Marco Polo, and Kublai Khan, the 13th century ruler of the Mongol Empire. Polo describes a series of wondrous cities which are geographically unspecific, yet imbued with glimpses of reality. In the exhibition, the closest literal reference to a city is found in the ‘metaphysical’ cityscapes of Giorgio de Chirico (b. 1888, Volos, Greece; d. 1978, Rome, Italy). Calvino described de Chirico’s dream-like setting as a ‘city of the mind’; the steep perspective of an Italianate portico becomes surreal, surrounded by awkward shadows and melancholic skies. In the paintings of Maria Helena Vieira da Silva (b. 1908, Lisbon, Portugal; d. 1992, Paris, France) the physical architecture of the cityscape is splintered. She used ‘floating’ lines to draught architectural skeletons and achieved a profound illusion of space. She noted, ‘I want to paint what is not there as though it existed.’ As Polo recalled cities from memory, so Vieira da Silva’s imagined structures and landscapes were constantly shifting, as distant recollections. Gego (b. 1912, Hamburg, Germany; d. 1994, Caracas, Venezuela), in a series of Drawings without Paper, ‘liberated’ line from the constraints of two-dimensions. Her drawings describe true volume and space. Gego trained and worked as an architect, but her sculpture went beyond prescribed ideas of structure and the urban to more ethereal and abstract forms, linear environments hanging in space. 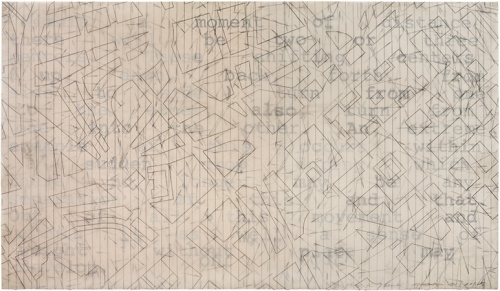 Structure described through a reduction to the essential line is central to Calvino’s thought and this exhibition. Of the work of Arakawa (b. 1936, Nagoya, Japan; d. 2010, New York City, USA), Calvino wrote, ‘...lines belong to bundles of lines which may have a common point of departure or else may converge in a point, in which case they create perspectives.’ Maps, floorplans, and diagrams of three- dimensional structures feature prominently in Arakawa’s painting from the mid-1960s to the mid-1980s. Then, working with poet and philosopher Madeline Gins, he redirected his energies to ‘reversible destiny architecture’, a term coined by them to describe an idealistic, utopian architecture. Arakawa’s drawings in this exhibition are from his transitional period, when he was beginning to think about the potential of architecture. Giulio Paolini (b. 1940, Genoa, Italy) and Calvino maintained a close relationship. The two were united by a common interest in the space of the mind and its representation. While Calvino approached it from a narrative perspective Paolini questioned it visually. Their exchange was premised on conceptual grounds and it brought to the fore how space could be envisioned and mapped. In this exhibition the notion of mental space will be explored in connection with the idea of imagined city. Calvino’s ‘spider web’ city swings over an abyss, tied with ropes to two mountain tops, its precarious situation opposing gravity. Parallels can be drawn with Tomás Saraceno’s (b. 1973, San Miguel de Tucumán, Argentina) prototypes for floating cities. His hanging sculptures, including ‘IC 4970/M+W’ (2016) in the exhibition, are part of his long-term research project, Cloud Cities, which aims to develop a ‘modular and transnational city in the clouds’ that represents a model for sustainable and emancipatory building practices. Flavia Frigeri is an Art Historian and Curator, currently Teaching Fellow in the History of Art department at University College London. Previously she served as a Curator, International Art (2014–16) and Assistant Curator (2011–14) at Tate Modern, where she worked on exhibitions, acquisitions and permanent collection displays. She co-curated (with Jessica Morgan) The World Goes Pop, a reassessment of pop art from a global perspective. Previous projects include Henri Matisse: The Cut-Outs, Paul Klee: Making Visible and Ruins in Reverse. From 2010 to 2011 she was the Solomon R Guggenheim Foundation’s Hilla Rebay International Fellow. She has written widely on: Post-war Italian Art, Pop Art, exhibition histories and contemporary art.